Nancy Paulsen Books, 9780399256912, 224pp. Prairie Evers is finding that socialization isn't all it's cracked up to be. She's been homeschooled by her granny and has learned the most from traipsing through nature. But now she has to attend public school, and feels just like her chickens--cooped up and subject to the pecking order. School is a jolt for Prairie until she meets Ivy, her first true friend. But while raising chickens and the great outdoors have given Prairie wisdom and perspective, nothing has prepared her for the give and take of friendship. When Prairie finds out that Ivy's home may not be the best place for Ivy, Prairie must corral all her optimism and determination to hatch a plan to help. Fabulous writing and a narrator full of personality distinguish this lively middle-grade novel. Ellen Airgood grew up on a small farm, and for the past nineteen years she and her husband have run a diner together in a small town in Michigan. 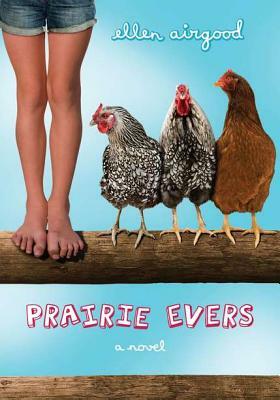 She also wrote the adult novel South of Superior, and Prairie Evers is her first middle-grade novel. She lives in Grand Marais, Michigan.